CropGard is a heavy duty, high quality wind driven bird scarer, raising the standard in bird scaring technology! Precision engineering that is built to last, high quality heavy duty construction. Unrivalled quality and design make this unit the most robust and reliable rigid spinning bird scarer on the market today. Built to withstand the UK’s harsh climate CROPGARD will last for many maintenance free years. Disorientate the birds with reflective, flashing movement as the CROPGARD spins. 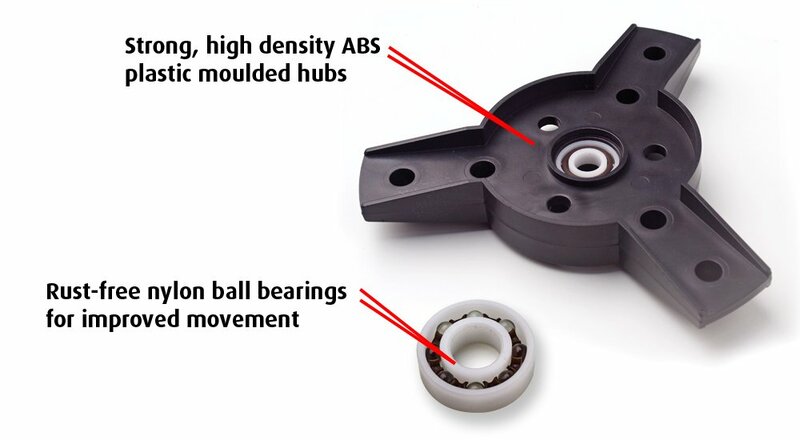 Strong, high density ABS plastic hubs with precision rust proof ball bearings ensure movement in the lightest breeze. As the wind rotates the fins, the combination of unsettling movement, bright warning colours and flashing strobe light effects, panics, alarms and confuses the birds.